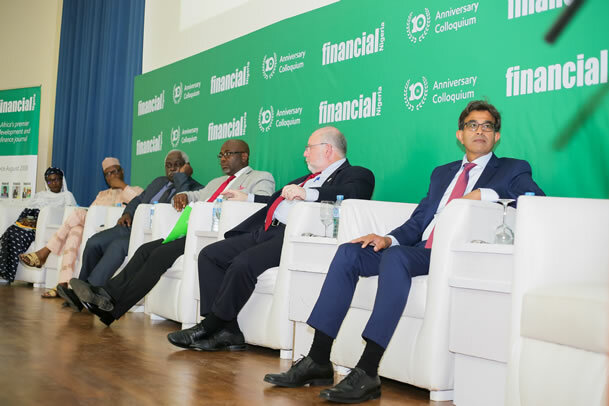 Financial Nigeria’s 10th Anniversary Colloquium held last month at the Shehu Musa Yar'Adua Centre, Abuja. The event brought together development policy thinkers, government officials and social entrepreneurs whose incisive ideas can influence better policy outcomes in Nigeria. 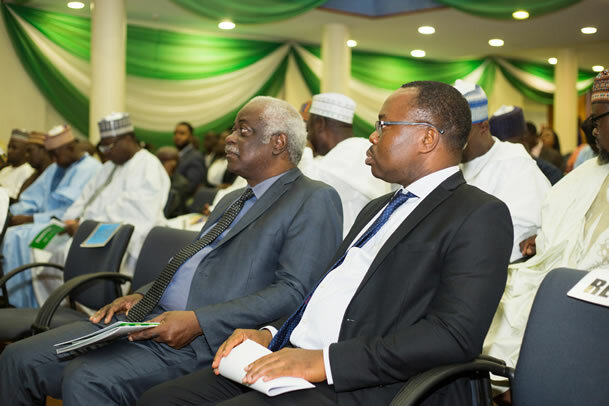 Altogether, it was attended by over 250 participants, including some institutional and individual subscribers of Financial Nigeria, and representatives of professional bodies such as Manufacturers Association of Nigeria (MAN) and FITC – a non-profit organisation owned by the Banker's Committee. The lectures delivered by the two keynote speakers – Dr. Muhammad Ali Pate, former Nigerian Minister of State for Health; and Mr. Arshad Rab, CEO, European Organisation for Sustainable Development (EOSD) – were both entitled, "Nigeria's Sustainable Development Agenda." 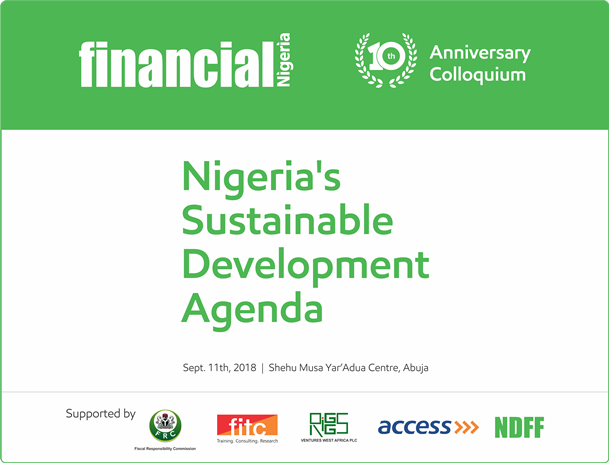 Organised by Nigeria Development and Finance Forum (NDFF), the conferencing arm of Financial Nigeria International Limited – publisher of Financial Nigeria magazine – the colloquium was supported by Access Bank Plc. Other institutional support for the successful hosting of the event came from Fiscal Responsibility Commission (FRC), Riggs Ventures West Africa Plc and FITC. Dr. Pate, who is currently an adjunct professor at Duke Global Health Institute in the United States, situated the discussion on Nigeria's sustainable development agenda within the context of the global Sustainable Development Goals (SDGs). He said the mostly inter-related and inter-dependent 17 SDGs have become the reference points for measuring progress towards the global agenda to put the world on a more sustainable path. The SDGs aim at ending extreme poverty; achieving zero hunger; good health and well-being; quality education; gender equality; clean water and sanitation; affordable clean energy; decent work and economic growth; reducing inequalities; sustainable cities and communities; responsible consumption and production; climate action; life below water and on land; peace, justice and strong institutions; and partnership for the goals, which pivot on the three pillars of economic, social and environmental sustainability. The colloquium was organised at a critical juncture in the nation's history. Nigeria's large – and youthful population – is growing at a fast rate. By the year 2050, it is estimated that the population will be more than 400 million. To realize demographic dividend, Dr. Pate said the country must first undergo a demographic transition (change in the population structure). This entails a shift from higher fertility and child mortality to relatively lower fertility and child mortality. In the meantime, he said demographic transition in Nigeria is "slow, variable and achieving the dividend is not guaranteed." Nigeria’s development challenges exist in an increasingly unpredictable world, where climate change, conflicts and disruptive technologies are upsetting global stability. In the context of these challenges and uncertainties, the chief executive of the EOSD emphasised the need for Nigerian policymakers to learn in short order the need to create "adaptive policies." One of such policies proffered by Mr. Rab is “sustainable industrialisation.” This entails the reduction in the carbon intensity of economies and adoption of clean and environmentally-sound technologies in industrial processes. Rab's prescription for Nigeria to embrace emerging development policies was in agreement with Dr. Pate's call for the promotion of “policy entrepreneurship” in Nigeria. Simply put, policy entrepreneurship is the ability of certain agents or shapers of change to find policy solutions to societal problems through innovative thinking. Apart from the high level of poverty and unemployment, some of Nigeria's problems, which require urgent policy attention, include the burden of both infectious and non-infectious diseases such as malaria, tuberculosis, HIV, diabetes, hypertension, heart disease, cancers, among others. To reverse the negative trends and put the economy on a firm track to achieve the SDGs, the former Minister of State for Health advised that there must be a reform of the political system for better governance and rational policies that will usher in sustainable growth and development. He called for an intense focus on human capital development, stating there is a need to urgently reform the entire educational system. He said a culture of volunteerism must be established in the country to promote civic engagement and mobilize the tremendous energy of teeming youth, women and popular figures. The keynote speakers and other members of the high-level panel agreed on an agenda to invest in the human capital of the country, with Rab echoing the need for “human capital that is capable of critical-thinking and systems-thinking.” In a proposed reform of the education system, it was recommended at the colloquium that no child should be left behind. Over the last decade, Financial Nigeria has provided a platform for many of these policy ideas to be discussed. Jide Akintunde, Managing Editor of the monthly magazine, provided the welcome address at the colloquium. Speaking nostalgically about when Financial Nigeria was established 10 years ago, Mr. Akintunde said it was the need to support advocacy for sustainable development that led to its introduction on the Nigerian media scene. "I remember easily that the main feature of our debut issue was “Agenda for Sustainable Banking,” he intoned. He expressed genuine appreciation to all the readers of Financial Nigeria and stakeholders who have supported the publication over the years. 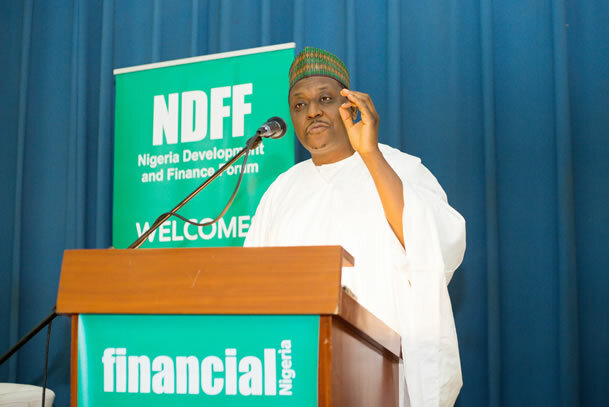 He said the publication, which has been the leading publication in Nigeria, providing thought leadership in the fields of development and finance, will continue to remain objective, honest and champion the collective progress of the country. Mr. Akintunde, who is also Director of Nigeria Development and Finance Forum, expressed his objective for the colloquium as an event he hoped would "proffer cogent ideas for policies and marketplace practices that will address the country’s priority and most impactful development needs." His optimism about Nigeria was shared by a number of the high-level panellists, notably the US Ambassador to Nigeria, Ambassador Stuart Symington; and Dr. Femi Aribisala, international relations scholar and chairman of Financial Nigeria's editorial board. In his remarks, titled: "The Outlook of the United States on Nigeria's Sustainable Development," the US Ambassador, who was represented by the USAID Mission Director, Stephen M. Haykin, said the US was bullish on Nigeria as he spoke decisively on the country's valued partnership with the United States. He underscored the strong partnership by the trade surplus Nigeria enjoys with the United States. Indeed, trade statistics show Nigeria’s exports to the US totaled $6 billion in 2017, while the US exported $2.2 billion in goods to Nigeria. According to the US Ambassador, the three pillars of the bilateral cooperation between the two countries involve strengthening governance capacities, support for efforts to increase economic opportunities, and investment in the Nigerian people. In the context of US-Nigeria relations, the Ambassador said the American government actively supports efforts to increase economic opportunities and job creation, especially for the large number of Nigerian youth entering the workforce. One of the largest parts of its assistance portfolio is health, where the US focuses on increasing capacity for primary healthcare, maternal and childcare, immunizations and family planning. The US government also focuses on HIV/AIDS, tuberculosis, malaria and polio. The diplomat said American government focuses on access to and quality of primary education in Nigeria, while also supporting sustainable access to clean water. A decisive factor in Nigeria’s sustainable development path, according to the Ambassador, is the dedication of Nigerians to a common and inclusive agenda. He said this requires leadership by the government, civil society and the engagement of Nigerian citizens. Dr. Femi Aribisala adulated Nigeria's potential, speaking proudly of it as an amazing country. "It is a country teeming with exceptionally energetic and enterprising people; from North to South; from East to West. It is a country highly endowed with resources, both human and material. It is a country, which, just a few years ago, Barack Obama, then-president of the United States, described as a strategic centre of gravity in Africa; even proclaiming the country as the world’s next economic giant." Speaking on the foreign relations imperatives for a Nigerian sustainable development agenda, the former Research Fellow at the Nigerian Institute of International Affairs (NIIA) discussed the need for a paradigm shift in the worldview of the Nigerian leadership. He said the country ought to use foreign-policy as a diplomatic means to promote the interests of the Nigerian people, while advocating for a "new generation" of Nigerians who will bear the responsibility of being Nigeria's new ambassadors. He said, Nollywood can become a powerful instrument of Nigeria’s foreign policy, having been a thriving industry at home and abroad. In this regard, Dr. Aribisala emphasised a "Nigeria first" policy whereby Nigerians and Nigerian enterprises are given priority. In a similar vein, Jide Akintunde said "For the country to deliver its best to the citizens, we believe the corporate and individual citizens must first give our best for our country." According to the speakers, other hordes of Nigerians that must be prioritized and whose potential should be harnessed are those in the diaspora. While Dr. Pate said, “We need pragmatic approaches to tap into their energy and align them with those at home to assist us in innovating or leap-frogging our way,” Dr. Aribisala spoke of the “ethnicity of capital” as what makes the identification with diaspora Nigerians the more imperative given the increasing level of remittances they send back home. Other members of the high-level panel were Dr. Kole Shettima, Africa Director at the MacArthur Foundation, and Dr. Amina Salihu, Senior Programme Officer at MacArthur Foundation. In his remarks, the Ag Chairman, Fiscal Responsibility Commission (FRC), Barr. Victor Muruako, discussed fiscal sustainability as a strategy for Nigeria's sustainable development. Among his policy prescriptions is the need for the federal government to take proactive steps to transform the structure of the economy from overdependence on crude oil and to fix the debt limit of all tiers of government in compliance with the Fiscal Responsibility Act. To foster fiscal transparency, Mr. Muruako said all public allocations, earning and spending at federal, state, and local government levels should be made public. He said access to information on public finance management should be made a fundamental right of all Nigerian tax payers. He noted that such mechanisms were necessary to bolster the fight against corruption, an agenda that is front and centre in the administration of President Muhammadu Buhari. A key agenda that speakers at the colloquium emphasized was the need for competent leadership to transform the trajectory of Nigeria. The 2019 election would provide a pivotal moment for the country to have a new leadership that would take up the challenge of focusing on priority goals for the sustainable development of the Nigerian people, economy and the environment. The colloquium was widely reported in the media. Specifically, media coverage was provided by organisations such as Nigerian Television Authority (NTA); Federal Radio Corporation of Nigeria's (FRCN) KapitalFM 92.9 Abuja; Cool FM 96.9 Abuja; Nigeria Info 95.1 Abuja; Wazobia FM 99.5 Abuja; and 104.5 Love FM Abuja (Crowther Radio). Others were News Agency of Nigeria (NAN), Thisday newspaper, Guardian newspaper, Punch newspaper, Leadership newspaper, Vanguard newspaper, The Nation newspaper, Tribune newspaper, among others. Below are links to the various press reports.